Next to time spent in the classroom, preschool lesson planning takes up the majority of your staff's time. Are they intentionally planning based on child outcome goals? We know that planning is crucial if we are to meet the growth and developmental needs of our preschoolers. However, many teachers do not plan in advance but, rather, plan a week or even days before the activities are to be utilized in the classroom. Why is this? Regardless of the reason, when preschool lesson plans are not intentionally planned in advance, the result is a set of plans where preschool learning goals and objectives are incomplete. There are two primary reasons teachers do not plan in advance. This is the number one reason for not planning in advance. In our field it has become the accepted "norm:" that lesson planning on personal time is just "the nature of teaching". This needs to change. Yes, we all love teaching and we all say we are "not in it for the money". Teachers love teaching, but they are NOT volunteers. Your staff accepted a position expecting to get paid for their time. They should not be expected to volunteer hours of their time creating and preparing lesson plans each week. And that is exactly what we are telling staff that we expect them to do when there is not paid planning time in their schedule. I recently looked up planning time for teachers online. The average amount of time most teachers receive is 10 minutes of planning time for every hour of instruction time. Now, that is based on public and private school for K-12. In preschool, I do see it differently. For example, in a 3 hour program, one hour of that time does not require planning (potty breaks, snack time, clean-up time, etc.). Based on that, I have developed a formula with regard to determining the time needed for preschool lesson planning and the gathering of materials and supplies. It will take the average teacher one hour (at a MINIMUM) per week to plan and gather materials needed for activities for a half day, 5 day a week program. If your staff works in a full day program, you can expect the teacher to spend two hours (at a minimum) per week for planning. The question: Are they paid for it? It is not only an ethical question, but a legal one. Employees must be paid for time they are expected to put into their job. How do we do this when our budgets are already stretched? Find a way. The quality of the planning will equate to the quality of learning. You need to either add planning time into their schedule or provide coverage in their classroom for planning time. For a half day program, I recommend adding the 1 hour or 2 hours each week at the end or beginning of one day each week where the staff plans together. For a full day program, there are two options. 1. Add the 1 or 2 hours to the end of one day. If, however, your staff are full time and work a 40 hour week with a 1/2 hour paid lunch time, add 1/2 hour to each day. 2. The other option is to send a substitute into the classroom for one (or two) hours each week (even if that substitute is you) Is time set aside for their classroom to be covered for them to intentionally planned? Many teachers have great ideas and they will, for example, on Monday think, "Oh, I'm going to do this activity on Thursday with the kids." Sometimes, this is how all of the preschool lesson planning is done. In their heads. Not with intentional, long-term outcomes in mind. They may have a great math game planned or a great circle time activity, or perhaps they plan their day around crafts but not creative, hands-on art. I'm not saying the activities they come up with are not fantastic and developmentally appropriate. What I'm suggesting is they may not be meeting longer term goals. Does your staff know what your program's child outcome goals or objectives are? 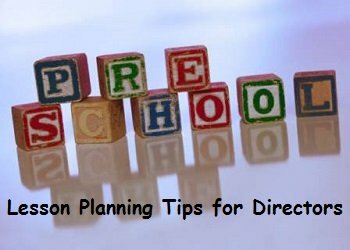 As a preschool director, one of your roles with regard to staff training and development, is to help your teachers take a good look at the plans they write and why? It is such a cute craft and goes along with our theme of __________ (fill in the blank). The parents will LOVE this one when the children take them home. Doing this activity will help the children stay focused at Circle Time. It is a great science experiment. It will help the children learn their numbers. These statements are all, most likely, very true. This will help the children learn one-to-one correspondence. This will help the children develop fine motor skills. This will help the children become involved in circle time (as opposed to "focused at circle time"). These statements are also all, most likely, very true. How will the children meet the goals and objectives we have for them with this activity? Of course, in order to meet goals and objectives, the teachers need to know what they are. Many of your programs have specific, observable, obtainable goals for each age group. Many of your programs do not. Or, many programs have observable, obtainable goals but this one set of goals is applied to all your programs. What I mean is that the same goals are applied to the three year olds as to the four year olds. Each age group needs to have their own developmentally appropriate goals. We should not see the same activities happening in both classes all the time. If you do not already have goals in writing for each of your classrooms, take the time to develop them. I would suggest that you sit with your staff to review and edit them. Once complete, have a staff training on curriculum development where you go over the goals and share ideas on how to meet them. I am in the process of developing a comprehensive Learning Objectives for Preschoolers book. There is no universal set of objectives and I realize they can vary from state to state. Therefore, I will be taking the accepted norm for the U.S. and setting up objectives that I hope you will find useful to your program. I will announce it in the Director Files Newsletter when it is available. Be sure to sign up for this free newsletter! Click here to subscribe today. What are your year end goals for each developmental area for your three year olds? For your four year olds? Do you have them listed so that your teachers know what their planning goals are? If not, you are taking a chance in areas of development not being planned for. Once you know what your goals are, planning activities will be centered around those goals and have more direction. To get you started, check out the milestones that I have listed. As you will see, each age builds on the milestones reached in the last. Based on this, we would want to provide activities that develop (for example) fine motor skills, rote counting and letter knowledge by offering activities such as playdough, sorting, etc.) and letter recognition in the three year old program--and a LOT of it! You would then, in the four year old program, provide activities that build on those such as making the playdough into letters or numbers, or sorting items into bowls with numbers (3 in the bowl labeled 3, etc.). Too often, we start with higher level skill development before giving the children the basics of what they need to move into those areas. Once your staff knows the goals for the children in their classroom, they can base their planning on those goals. Preschool teachers use traditional and not so traditional preschool themes or topics to develop their curriculum and lesson plans. Your teachers should use the math, science and other preschool lesson plan ideas as a base to start with. They should then adapt the activities to meet the goals planned in their classroom. I have many done-for-you resources created here. For example, Let's say one of the math activity ideas is to set up bowls with numbers on them and the children counting the corresponding number of items into the bowl. If your teacher's children are still working on number sense (rote counting and basic sorting), then the goal is not counting the correct number for this class, it is rational counting (saying one number for each item they count). So, for this math activity idea, your teacher may want to place bowls out with NO number on them and simply encourage the children to count while they sort. I have a comprehensive collection of preschool themes to help your staff as they work on their preschool lesson planning. Each theme includes at least a week's worth of age appropriate ideas for your Interest Learning Centers including art, science, math, dramatic play, writing, reading/library, easel, cooking and more! I also have many of the most popular themes already created with activities, completed lesson plan forms and more ready to print, cut, laminate and use. Click here to see which of these will save time for your staff. 1. PAY your staff to plan. 2. TRAIN your staff to plan. Your teachers are the foundation to providing quality child care. You need to give them the pay (i.e. pay them for their preschool lesson planning time) and the tools (providing them with, or developing, learning objectives to follow) that they need and deserve to do their jobs and do it well!